How good are residential plots for investment? Buying residential plots for value appreciation in developing areas is a good move. Property investors are now looking at residential plots as better options of investment. Well connected residential plots offer good returns. DELHI: When you see an area is growing and the appreciation is improving, surely you can choose residential plots in the area as options of investment. Comparatively the land prices will be lower in remote areas. For instance if the land prices in the prime location is Rs.10000 per sq. ft., it will be Rs.200 per sq. ft. in the remote areas. However the nearest hub must be reachable within an hour. Lesser the travelling hours to the city, the higher the appreciation you will get. Connectivity and infrastructure developments are also to be noted. If the connectivity is poor or the infrastructure is weak, your investment may not bring the desired result. Closeness to the railway station, metro station, the nearby bus stop/stand, etc. too are to be considered. They also play their roles in determining the prices. Residential plots inside gated communities are better options of investments. The closeness to schools, colleges, hospitals, entertainment and commercial facilities are also important. If all these are present, there is no doubt you can fix the deal. If the residential plots are close to some good residential and commercial hubs the appreciation will be higher. Another important feature which you have to look in your plot is that whether it is connected with an access road. Further it should be wide enough. As there is higher demand for corner plots, this would be the best for investment. Plots facing east or west also are demanded. The specialty of such plots is that it facilitates natural light and free-flow of air. If the residential plots are inside a gated community it is far better. 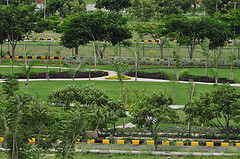 The plots inside such ventures normally have parks and other facilities. This will boost the buyers’ sentiment. Normally there will be some provisions for the commercial developments as well. This entry was posted in Articles, Real Estate News and tagged corner plots, gated community projects, property investment, real estate investment, residential plot development, Residential Plots by designer. Bookmark the permalink.